I don't know about you, but I'm looking forward to starting some Summer sewing! If that's your plan too, I have some projects to get your started. 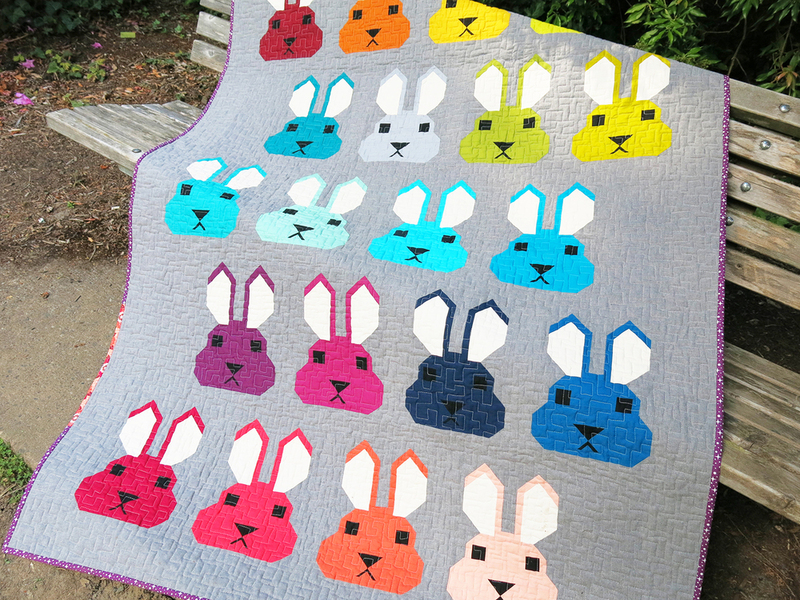 My Bunny quilt pattern is now available in my pdf pattern shop. Print patterns will start shipping to shops next week. Bunny includes instructions for large and small lap quilts and, like my other animal patterns, is made entirely with rectangular shapes and simple diagonal seams. No paper piecing or templates! The sample quilt is the 51" x 71" Large Lap Quilt. I made this one using the palette of Kona coordinates that I selected to go with my Rhoda Ruth print collection. (They're listed in the pattern and pattern listing.) The ears are face details are Kona Natural and Espresso, and the Background is Essex yarn-dyed linen blend in Graphite. I love all the animal blocks, but it was so much fun to take a break from them to make these flowers! 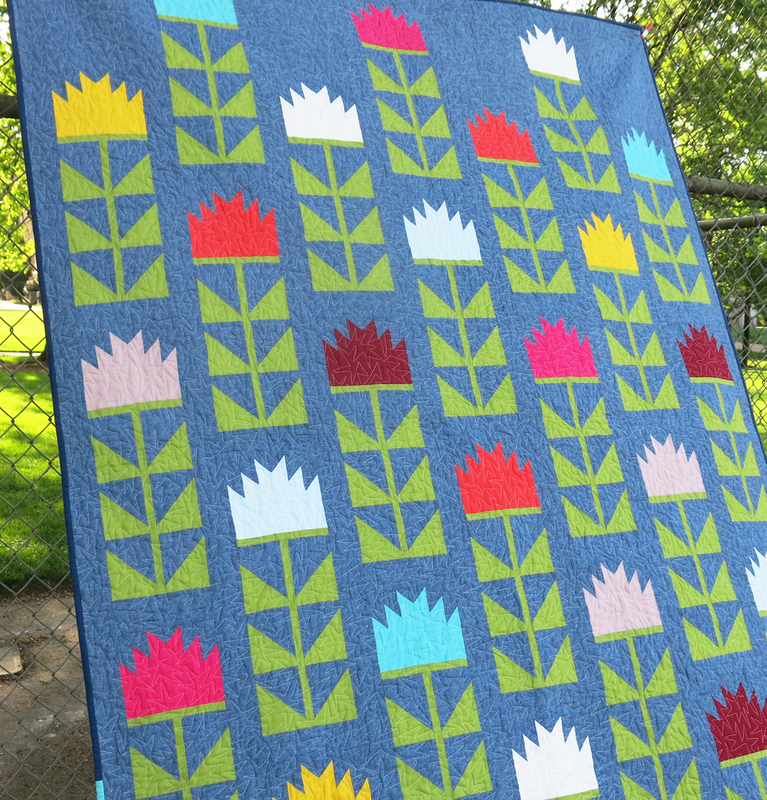 This is Thistle, another quilt pattern made using the same techniques, and now available in my pdf shop. This quilt is made entirely with Essex cotton/linen blend, the colors of which are included in the pattern and pattern listing. My sample is the 58" x 82" Large Quilt version and the pattern also includes Small Quilt and pillow variations. Through Sunday, June 21, use the code JUNE25 at checkout to take 25% off your entire pdf pattern order. Shop now. Over on the Projects Page, I've just posted a new pattern add-on project for The Kittens quilt pattern. Cat Friends is a 16" x 26" pillow similar to the Fox and Hedgehog pillow that I made earlier this year. These come together pretty quickly and are great for gifts. I'm still working to reconstruct projects from my old site and have added a few more during the last week. Be sure to keep an eye on the Projects Page for new additions and subscribe to my newsletter to receive updates. Happy Summer Sewing to everyone!